For more than thirty years, CASA of Los Angeles has been providing highly trained volunteer court-appointed special advocates (CASAs) to aid abused and neglected foster youth, forever transforming their lives for the better. What exactly does a CASA do? A CASA is assigned by a Dependency Court judge to an at-risk child and investigates the child's home life, identifying educational, physical and mental health challenges, and meeting with all the adults in the child's life, including parents, teachers, lawyers and social workers. The CASA then makes recommendations to the judge – offering suggestions for ensuring the child's safety, achieving permanency and promoting the child's well-being. The CASA also supports the child over the long-term on a personal basis, as a stable adult who cares about the child without being paid to do so. Add four full-time staff members focused on recruitment and outreach to communities throughout Los Angeles County. Increase training staff to include three full time trainers, broadening training opportunities and allowing CASA/LA to more quickly process volunteer applications, conduct prospect interviews, and provide pre-service training. Advertise on local NPR stations, promoting CASA of Los Angeles as an opportunity to prospective volunteer candidates interested in community affairs. The My LA2050 grant also provided CASA/LA a new level of exposure that greatly aided in recruiting more volunteers. Since the beginning of the grant, CASA has significantly increased the number of volunteer inquiries received, the number of people attending information sessions each month, and the number of viable applicants. The organization is currently on track to recruit and train 250 new CASAs by the end of 2016! In addition, CASA has been able to increasingly recruit from populations which best reflect the children served, including the Spanish-speaking, Latino, and African-American communities, as well as engaging more men and volunteers from a wider array of professions and age groups. Through the My LA2050 grant, CASA of Los Angeles is building its capacity and working to transform the lives of our community's most vulnerable citizens: abused and neglected children in the foster care system. 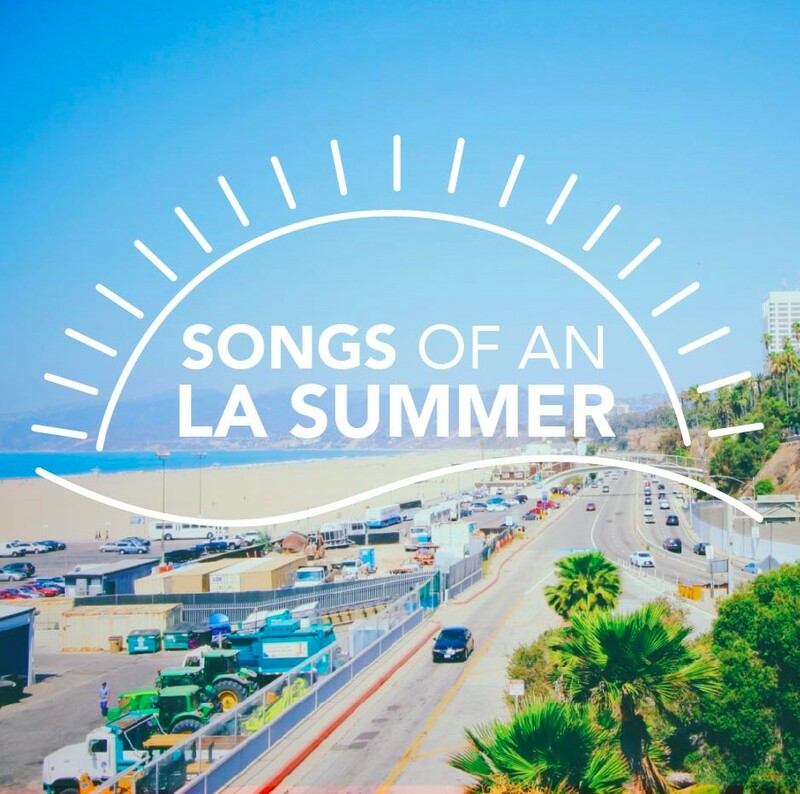 We're celebrating the start of summer in LA with a new series of playlists featuring Los Angeles as our muse. These songs are from LA-based artists, feature LA as a character, or inspire West Coast feels. Check out the full playlist here and see the track listing below. Follow us on Spotify to keep up-to-date on these summer jams! My LA2050 is back... with some exciting changes! The My LA2050 Grants Challenge has exceeded our greatest expectations. Angelenos have helped surface hundreds of creative and innovative ideas to make Los Angeles a thriving metropolis. Feedback is important to us at LA2050. And we're making some improvements to the grants challenge, thanks to suggestions from Angelenos like you! 1. Applicants can submit proposals for three different grant amounts. You can submit an application for a grant of $25,000, $50,000 or $100,000. 2. We're switching platforms. After a few great years working with GOOD Maker, we're switching to a new platform powered by Skild. We're in build out phase now but there are exciting improvements to the application and voting processes to come. 3. You'll be able to leverage your application by providing an opportunity for the public to donate to your idea or volunteer for your organization. We're adding easy activation buttons to the publicly viewable submissions to help you engage Angelenos interested in your idea. 4. Voting will last one week and will begin on October 18th. 5. We're getting ready to celebrate your great ideas even sooner. Save the date for #CelebrateLA. This year's public celebration of LA changemakers will take place on October 18th, aligned with the opening of the public voting period. We're looking forward to your great ideas! Don't forget to attend #LA2050Collaborates to workshop your ideas with other LA social innovators. We're days away from the election! RENT Poet & Melrose Poetry Bureau are bringing poets to your local polling station to write personalized poetry on typewriters in English and Spanish for voters waiting in line. Their goal is to engage the public in the generative, creative process we all know politics can be! Check out #PoetsatthePolls and their #WritetoVote social media campaign. 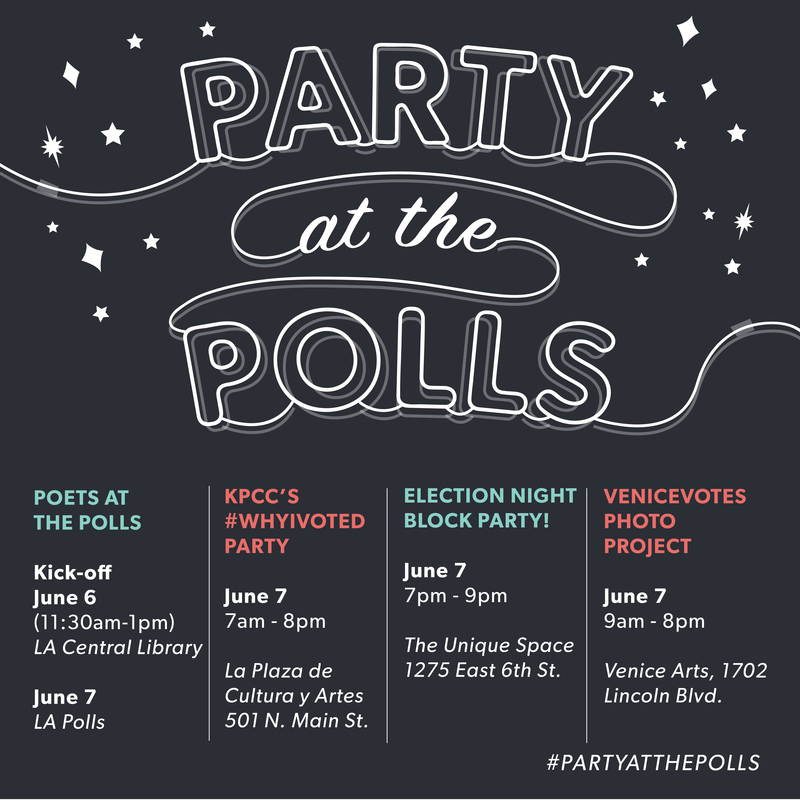 Venice Arts will serve not only as a polling place for the California Primary Elections on June 7th, they will also be hosting a professionally run photo booth to capture the many different reasons people vote. #VeniceVotes will not only be Venice Arts' first interactive photo booth project, but will become a living album of portraits that speaks to the uniqueness of Venice and the vital importance of civic engagement. Show Venice Arts why #VeniceVotes. The Unique Space wants you to participate in local elections and is throwing a giant block party on election night to celebrate. After hitting the polls, head over to their space where they'll transform their 5,000 square foot parking lot into an outdoor block party with FREE food, drinks, a DJ, photo booth, games and interactive art installations. Don't forget to wear your “I Voted" sticker to be entered into really great contests, and the first 200 people through the doors get a bag full of swag! RSVP here. Celebrate Election Day with KPCC's #WhyIVoted party. Bring your "I voted" sticker and join the KPCC In Person team at La Plaza de Cultura y Artes in downtown Los Angeles to celebrate your decision to vote in the election and, we hope, encouraging others to do the same. RSVPs not required but let KPCC know if you can make it here. 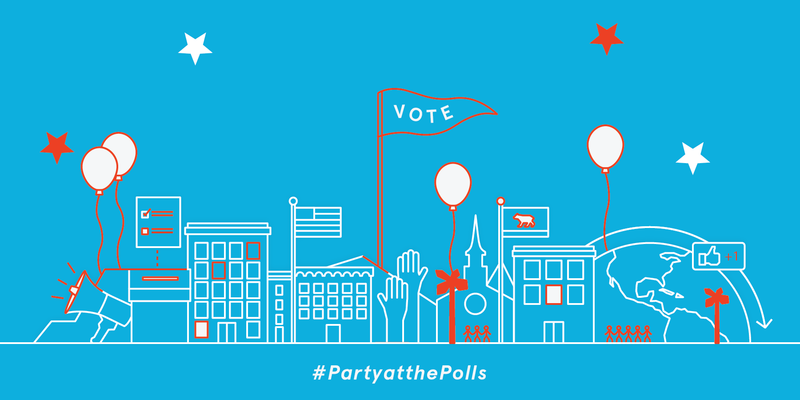 Eight winning ideas to #PartyatthePolls! Three weeks ago, we asked Angelenos for event ideas to improve voter engagement and turnout in the upcoming primary election. Today, we are excited to announce that eight proposals will receive $3,500 apiece to pilot events between May 17th and June 7th. These proposals represent a sample of the truly creative voter engagement ideas we received, ranging from using comedy to communicate about elections to conducting direct outreach to first-time voters and immigrants to encourage them to head to their polling locations. In all, these #PartyatthePolls events will spark conversation about civic engagement among thousands of members of our Los Angeles community. We can't wait to report back on these events, so please stay tuned. You are also welcome to join the events where noted. Be sure to follow these and other great voter engagement activities all across Los Angeles using #PartyatthePolls. And, don't forget to vote! For information about voting in LA County, visit www.lavote.net. Coalition for Humane Immigrant Rights of Los Angeles will recruit 100 volunteers to participate in a day-long canvassing party on June 7th to educate the immigrant community in Pico-Union about the importance of their vote and to provide information about participating in the elections. Green Dot Public Schools will build excitement around the major milestone of voting for the first time for students at five of their 11 high schools. The GOTV effort, “Get on the Bus!" will build on the charter school network's registration of more than 1,000 students and will provide transportation and celebrations for 250 graduating students who will take their first act as adults by voting in a national election. The United Way of Greater Los Angeles will organize a “March to the Polls" for LAUSD students participating in their L.A. Youth Vote campaign, a yearlong effort to position local high schools as centers of youth engagement and advocacy. The march will culminate in an event that celebrates students for engaging in the democratic process. * indicates a public event. Feel free to join! Let's get ready to #PartyatthePolls! Together with the Angeleno community, we have outlined a goal to make Los Angeles the best place to connect and to make our region one where every resident is empowered to contribute to our civic processes. Los Angeles can be made better if all Angelenos are enabled and encouraged to use the power of their civic voice to create change in their community. However, we know that voter participation as a measure of civic engagement has hit historic lows in LA, and the voter population is not representative of the diversity of the region. But you can help change that. Are there barriers to voting in your community that you can help overcome? Can you help improve outreach and increase awareness of the election in your neighborhood? Or do you have a fun idea to encourage civic engagement that you're excited to test? Apply for a $3,500 grant to host a #PartyatthePolls event that will promote voter engagement in the upcoming June 7th primary election. The application and additional details can be found here. The events should be participatory and engaging, but the format and design are completely up to you. From pop-up parties at polling places to providing child care for families waiting in voting lines, the possibilities are endless. Applications open on April 26th at 9:00 am and are due by midnight Pacific Time on May 10th. Email us at [email protected] with any questions. Join LA2050 and the California Community Foundation for a twitter party about how we can come together to build the LA of our dreams. 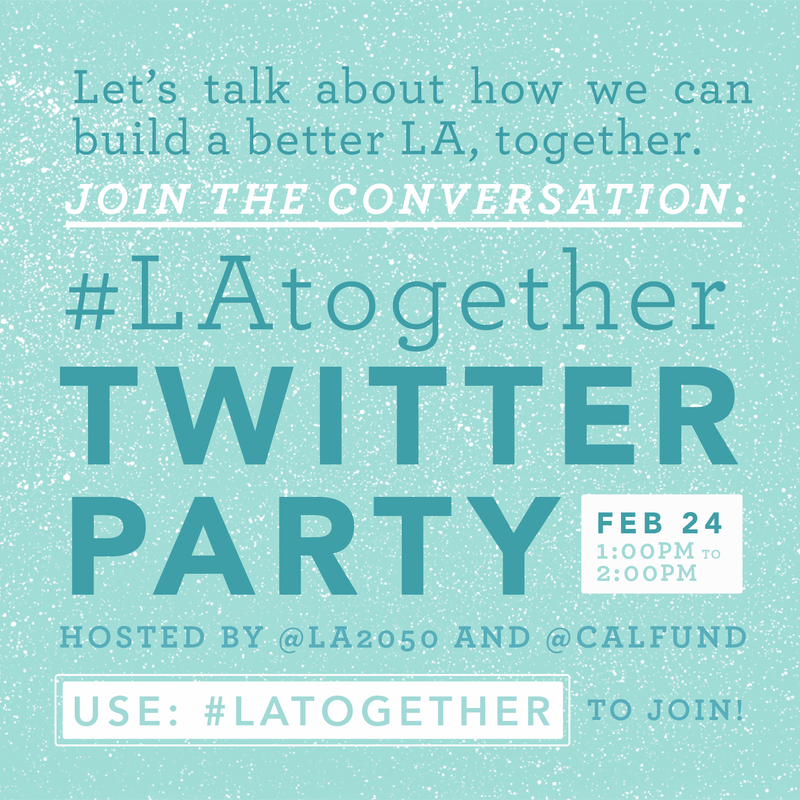 Follow #LAtogether on Feb 24th at 1pm to participate! Not sure how to join a twitter party? Check out our handy Twitter party guide--we've got you covered. Congrats to the winners of the My LA2050 Grants Challenge! 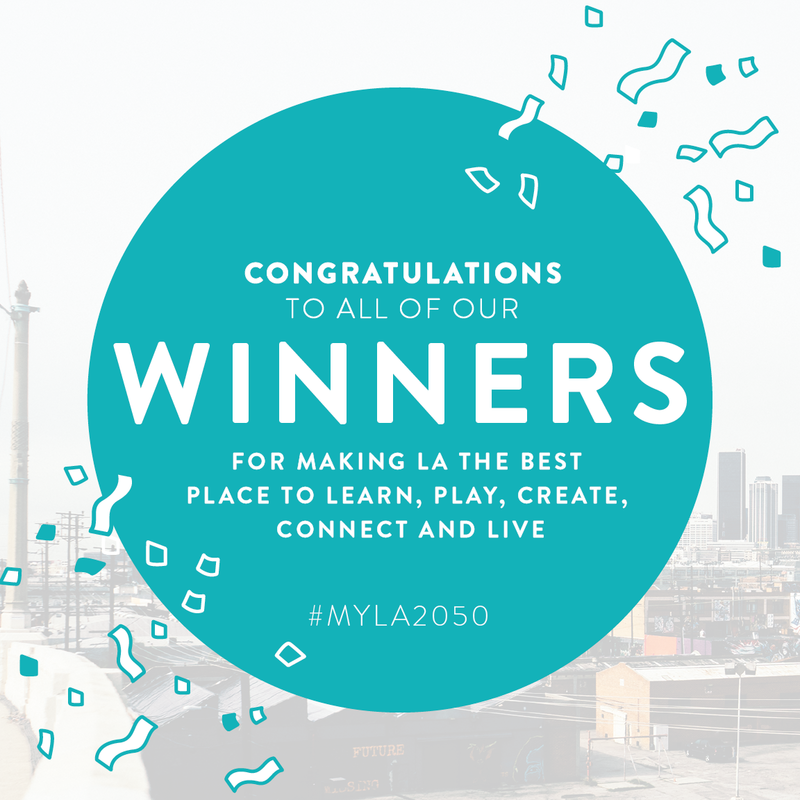 Congratulations to the winners of the My LA2050 Grants Challenge! It was a tough process choosing, as we received so many fantastic ideas. We are excited to announce the ten winning proposals to make Los Angeles the best place to learn, create, connect, play, and live. LEARN: Citizens of the World will develop a model incorporating social-emotional learning into everyday curricula, emphasizing self-regulation and social connection for healthy child development and school safety. CREATE: Los Angeles Review of Books will profile an LA writer or artist each day of the year, bringing exposure, locally and globally, to the vibrant creative community in Los Angeles. PLAY: Grand Park will pilot the installation of permanent shade structures designed by a local artist at the park in Downtown Los Angeles. CONNECT: Los Angeles Promise Zone Initiative will provide students living in the Los Angeles Promise Zone with summer jobs as young ethnographers to conduct 1,800 surveys measuring how the Promise Zone is improving lives. LIVE: Heal the Bay, in partnership with Pacoima Beautiful and the Pacific American Volunteer Association, will launch a multi-language conservation project to improve Angelenos' understanding of water challenges and to introduce Angelenos to water-saving strategies. LEARN: Girls Academic Leadership Academy (GALA), LAUSD's first all-girls public STEM high school will create a makerspace to provide students with hands-on experience using new technologies and innovative processes. CREATE: Los Angeles Bioscience Hub, in collaboration with East Los Angeles College (ELAC), will create the Biotech Leaders Academy, establishing a pipeline for East LA's bioscience students to become biotech entrepreneurs. PLAY: People for Parks will unlock six new community school parks in 2016, providing more than 25,000 Angelenos access to a safe park within 1/4 mile from their homes. CONNECT: CASA of Los Angeles will recruit and train 250 new volunteers who will serve as court-appointed advocates on behalf of abused and neglected youth in the foster care system. LIVE: Iraq and Afghanistan Veterans of America (IAVA) will provide at least 180 of LA's 320,000 veterans and their families with support as they transition to civilian life through referrals to critical resources and support systems. We are thankful for our partner funders, the Annenberg Foundation and the Roy and Patricia Disney Family Foundation who have committed an additional $600,000 to support ideas submitted via My LA2050. Additional grant winners will be announced in 2016. The My LA2050 Grants Challenge Results Are In! After verifying votes for the My LA2050 Grants Challenge, the leaderboards have been updated! Congratulations to the top 10 voted submissions in the five goal categories, among which one winner will be chosen to receive $100,000. We will also select another winner in each goal category to receive $100,000, irrespective of votes. We are proud to announce that more than 70,000 voters participated in the challenge. We thank you, My LA2050 submitters, for your inspiring ideas and for engaging your community to help make LA the best place to learn, create, play, connect, and live. Palisades Charter High School (PCHS): Palisades Charter High - Guiding the Path to College and Career Success! DSTL Arts, Emerging Arts Leaders/Los Angeles, Trade School Los Angeles: The P.L.A.C.E.–The Partnership for Los Angeles Creative Education serving LAs emerging creatives! Shane's Inspiration: Together We Play L.A.! CASA of Los Angeles: Be a Voice for LAs Foster Care Children! Golden Heart Ranch: Golden Heart Ranch... Creating Opportunities for Special Needs Young Adults. Heal the Bay: Dropping Knowledge Project – Building a Water-Literate L.A.
From East LA to DTLA to South LA, kids have been surfing and ocean-learning with Surf Bus Foundation! Big Citizen Hub: How are LA youth making an impact in their community? If She Can See it, She Can Be It! Help LA get on the SXSW stage! Coming to Hollywood: the Precise Barber College! Caltech's #Cleantech2Edtech program is helping LAUSD pilot new technology to mitigate the District's rising energy costs, with high school students! Announcing Roy and Patricia Disney Family Foundation + My LA2050 winners! LA's got super clean water--skip the plastic bottles! LA Times Food Bowl Events You Don't Want to Miss! #EarthMonthLA: Make a commitment to protecting LA's environment! More great ideas from My LA2050! A glimpse into LA’s future: How can driverless vehicles & new tech revolutionize a car city? Our favorite moments from #SXSL! With Angeleno input, Grand Park's 'Paper Airplane' now soaring high!